Below you will find successful advocacy activities submitted by Japanese language teachers from all over the United States. Get inspired! These ideas might strengthen your school's Japanese program too. If you would like to share an advocacy activity which has worked for you, please fill out our Real Advocacy Story Submission Form. Approved submissions will be posted below. Objective: Providing opportunity to interact with other discipline areas in our school community. Description: We invited our school's Child Development Class to our Japanese class: their 8 high school students and 14 pre-school children who are participating in the Child Development Class. The current topic in our Japanese class is Animals and the Environment. Students also learn many Japanese children's songs involving animal names and characters. Since these songs are for young children, it is very appropriate for our students to teach very tiny students. Two children among the 14 pre-school students told us they know "Zou-san" and other Japanese songs and they did a sing along with the YouTube song in Japanese which surprised all of us. Other songs we used were Tulip, Akai-tori Kotori and Twinkle Twinkle Little Star (Japanese version). Required materials: 30 print-outs of the Japanese children's songs, Youtube video of Japanese children's song with animated background. Preparation: One of my students who is also taking the Child Development Class told her teacher about our animals and environment theme and that we are learning many Japanese songs with animal characters in them. Her teacher then sent me an email and asked if they can bring their 14 students to learn the Japanese children's songs. We agreed on the date and period to do so. Promotion: I shared a photo and video of the event via our school's email system and online community group, and with the parents of the 14 pre-school students. Results: Other teachers and parents sent me appreciative and positive comments about the event. We decided to repeat this activity next year as well. Objective: In today’s education world, one of the most important concerns for the students, parents, teachers, and administrators is definitely the job markets for the students in the future. This is particularly important at the high school and college level. Fortunately, there are a lot of good jobs available for those with Japanese skills and knowledge of its culture around their communities because of a large number of Japanese owned companies in the U.S. For instance, in the Midwest (12 states), according to the data made by the Consulate General’s Office in Detroit in 2012, there are 2,401 Japanese companies, hiring 271,796 Americans. The number of Japanese residents in the area is 57,019. This area has 120 sister-states/cities in Japan. In Indiana, where I teach, there are 213 Japanese companies, hiring 42,610 Hoosiers (the official demonym for residents of Indiana), and these companies are spread out throughout the state of Indiana. (Indiana Companies with Japanese Investment made by CINERGY. www.cinergy.com/cedn ) A total of 71 cities host those Japanese companies. This is the reality and very few people know how much Japan is part of their community. Thus, in order to promote the Japanese program, I recommend the following activities for the Japanese teachers and their students. Description: Make a map of your state/community featuring Japanese companies. Have students make a brochure (in Japanese) describing that company. Visit that company (field trip). Required materials: Older students can design the brochure with programs like PowerPoint or Word. Younger kids could make the brochures with paper and markers. a. A map of your state with the cities where Japanese companies are located. The name of each city and the number of Japanese companies should be on the map. b. A map of the students’ community with a few other surrounding communities and the name of the Japanese companies and their business. The size of these could be any, depending on how they are used. (e) Community involvement activities. If the parent(s), relatives, or acquaintances of your students are the employees for the companies, it should be written with their comments on their work in those companies. A final product of this work would be to make a brochure of those companies. Step 3: Visit some of the companies/plants as a fieldtrip with collaboration of the companies. Promotion: Contact the local newspaper to let them know about the upcoming field trip. Results: This is a very powerful experience for the students, and their parents will hear about it from their children for sure. Description: We are selling original design T-shirts that can be customized (color, T-shirt, long sleeves, hoodie) by the buyers. The logo was designed by a student who won the logo-contest among students. Preparation: We held a logo design contest among students. Once the website for ordering the shirts were created, we shared the link to students, teachers, friends and family. Promotion: All the teachers wore the T-shirt to a local workshop and promoted the Japan trip and T-shirt sale. We made flyers and "commercial video" to share with others to promote the T-shirt sale. We posted photos of teachers and students wearing the T-shirt on social media. Results: T-shirt sales are increasing! Event date: Every November/December of odd years. 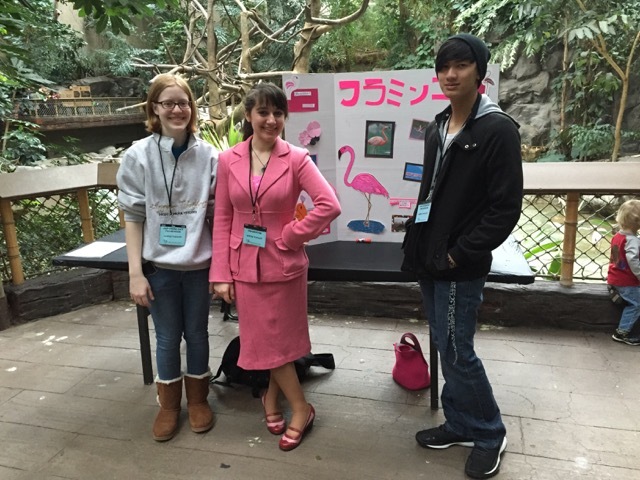 Objective: Bring students studying Japanese from all over the state together to learn and communicate with each other in Japanese about Zoo animals. Upper level students learn to teach about animals at a level understandable for level 1 and 2 students (observers), while these students get to learn from more advanced students. Description: Upper level language students to use music, costumes, and props to teach about specific zoo animals using only Japanese to lower level students. Those observer students each receive a “passport” which gets stamped after they participate in each presentation. Observer students are able to get a stamp from all presenter groups. Also, the presentations are judged by the zoo staff and given awards in terms of the best overall presentation and most creative. Required Materials: Each presentation group needs to provide and create a tri-fold board presentation that is understandable for level 1 and 2 students (observers). The zoo provides everything else (passports for observer students, tables and placement of presenting students). Teachers need to make and organize the bus and logistics of the field trip. Estimated budget: Observer students pay $11 to cover the event. Teachers often add the cost of the bus to the price as well. Presenting students do not have to pay for the event but often need to provide their own transportation to the event as they are expected to arrive earlier than the observers to set up prior to the opening of the zoo. Preparation: Each school uses class time to prepare. Some teachers make it a graded activity, others do not. Since the zoo does most of the work, the teachers just need to prepare their students, logistics and complete the field trip paperwork. Promotion: The zoo advertises it on their website. Results: The best part is that many zoo goers also participate. It is a great activity for the local community. Objective: To expose young kids(K-4) to world languages, foreign cultures, different manners & customs. Description: It was a program organized by the Westchester Library, Chesterton, IN for kids aged from K-4. Four local World language teachers/ residents (Japanese, Spanish, German, & French) were invited as instructors. We each introduced ourselves using our "Hellos" and "manners" such as "la bise"(French), and "bowing"(Japanese). We also talked and acted out the differences of customs such as "hugging/ kissing" is not very common (Japanese). We separated kids into smaller groups. Each instructor was in charge of the cultural station and had the kids' group lotate after 10 minutes or so. At each station, we had (store-bought) candies ready from the target culture and kids learned how to say basic phrases. They say "please" to receive a piece of candy and "thank you" after receiving one. They also learned good-bye, hello, anything they were interested. After all kids experienced all stations, a librarian read a multilingual book about manners and we all took parts in sounding out each phrase. Estimated budget: $20 or so, to buy candies. Preparation: There are not much preparation for the instructor side.This is what we do on a daily bases. Results: It was our 3rd year doing this. Every year, we have different audiences and we do things a bit differently, but the turn out is pretty good. Objective: Learn Japanese national holidays and Shichi Go San culture through hands on activities and use Japanese language at the event to communicate with Japanese people. Students had opportunity to help putting on Kimono to boys and girls and had chance to see how it is celebrated by the Shinto priest. Also they had chance to see Omamori and some bought it for their luck. I took many AP Japanese students and they learned about fall holidays and Shichi go san for their knowledge of annual events in Japan. Preparation: Japanese Culture Center of Hawaii was looking for first Aki Matsuri and Shichi Go San festival and we participated in and all enjoyed it. Communicating with the organizer was a key for success. Promotion: Email to both students and parents and talk in class. -After the event, students often talk about the event and they gained much knowledge on Shichi Go san. -They will not miss any information on the event for AP exam. -I shared all pictures with students and parents online and I received many feedback. -Students asked if they can participate more in the future in this kind of events. Objective: In Utah, most of the students take Spanish and French and there are many events available for them to attend. For this reason, UATJ (Utah Association of Teachers of Japanese) worked together to have this event at the most prestigious university in Utah. We wanted the community to see that Japanese as as important as any other language. Description: In March, schools that offer Japanese from all over Utah come to Brigham Young University to attend the Utah Japan Bowl. This event is divided in 3 levels, levels 1 to 3. Those students that win the Utah Japan Bowl get to compete in the Nationals Japan Bowl in Washington DC. In April, we encourage all our students to attend the biggest Japanese festival in Utah called Nihon Matsuri. Students are able to learn more about the Japanese culture and also buy Japanese souvenirs that are mostly only available to purchase on line or in Japan. Required materials: For the Japan Utah Bowl, students study the Nationals study guide. Students need to pay $15 that includes the entry fee, shirt and a prize to everyone that participated. Estimated budget: Students pay for this event. Preparation: It takes about half year to prepare. Since none of the Japanese teachers can be in charge of creating questions to be fair for all the other schools, we ask Japanese university professors to create language questions and put them in a PowerPoint presentation for the day of the event. Also, Japanese students from BYU work as volunteers proctoring tests and helping with the event. Promotion: We tell students about this event in the beginning of the year, give the study guide and the motivated ones work very hard to win this competition. Results: We ask the local newspaper to come to advertize about this event so that the community knows what is going on and that Japanese is a language actually available to take in many high schools in Utah. Objective: The objective is to motivate students to apply the Japanese language skills they have learned in a classroom setting to perform a play creatively in a meaningful way. Description: This theater contest is intended for grades 7-16 Japanese language learners to act out a play written and produced by themselves with a storyline preferably with props, visuals, and background music. Required materials: Poster, flyer/program, prizes, and refreshments. Estimated budget: Last year it was about $1200. We asked for the Japan Foundation language contest grant and we received it two consecutive years, East Asia Institute and the department of Modern language and literature also sponsored the event. Next year, Japan America Society of San Antonio will also sponsor the event. Preparation: The recruitment starts 5 month before the contest. We start making the program a month before the contest. As for the language instructor, I help students to write their scripts and act out, which takes about 3 months. Promotion: We send out the flyer to local high schools and universities. Results: We have a very good final product from each group. It is clear to see that students did put a great amount of time preparing the script and practicing. Objective: Highlight how students enjoy singing Japanese songs and promote the Japanese programs to all people. Description: This is a district-wide collaborative event, where 2 entries (solo or group) from 4 schools, a total of 8 songs, will be featured at the event. We have invited judges from the community who will also perform Japanese songs! We will have a "Shouting Contest"(大声コンテスト)for non-singers that are interested in testing out their loudness by shouting a Japanese word/phrase. Administration from the district will be present to share a short message too. This is the second year trying this event, but we hope it will be a tradition that will continue on! Teachers will perform as a surprise element. Preparation: Hosting school's Japan Club will arrange food/drink sales. Each school make a poster of the event to use as decoration in the venue. Rehearsal of the event with all participants a week before the event. Promotion: Email school staff, send press release information to local news papers. Post flyers around the school. Show the highlight video from last year to the current Japanese students when announcing about this year's event. Results: Those who participated as contestants and were there as audience seemed to absolutely enjoy the new event. Objective: Engulf students in authentic cultural and target language based activities and experiences. Description: The Los Angeles Mikoshi Association (aka Rafu Mutsumikai) was formed in 1994 by the founding members who carried a Mikoshi in the Los Angeles Nisei Week Grand Parade the previous year. The Rafu Mutsumikai was formed in order to uphold Japanese Mikoshi culture and to demonstrate the spirit of unity and cooperation displayed by those carrying the Mikoshi. For 20 years, we have participated in numerous Japanese cultural events in the U.S. We are regular parade guests at Nisei Week Grand Parade, the San Francisco Cherry Blossom Festival, the Torrance Summer Festival, and the Honolulu Festival. Over the past 20 years we have also been invited to local Japanese festivals in Detroit, Las Vegas, San Diego and Houston, and carried our Mikoshi in the MLK Day Parade. Required materials: Depending on the volunteer activity, students are required. Some students wore yukatas which were provided by the organizers of the event. Other students who performed Japanese songs, dances or cosplay on stage were required to prepare costumes and songs. Remaining volunteers had nothing to prepare other than money to sample food and products. Estimated budget: It was a volunteer opportunity. Money was required if the students wanted to purchase food or gifts. Preparation: The event was coordinated by the Japanese Chamber of Commerce along with various sponsors such as the Consulate General of Japan San Francisco. As for me, it was a chore to continually advocate and coordinate my volunteers before the event. I also helped supervise my students. I spent over 12 hours over the days of the event. Promotion: Everyday before class I keep reminding students about the event. Keeps interests high and secures students obligation to attend. Results: After the event, I interviewed my students on what they saw and experienced. Every student had an overall positive experience and planned to attend next year. Some discovered other Japan related interests such as Taiko and intended to pursue them further. Students' friends who volunteered also and expressed intention to take Japanese class. Objective: To provide members of the school’s community an insight to the support lent by parents, a look at the content and methods Japanese students are learning and how Japanese teachers are teaching, all in one day. Description: Students from 1st to 12th grade perform plays and songs, and do presentations. All performances have English subtitles so that student’s parents and friends, teachers and school staff can enjoy the event. Students taking Japanese spend about a month to prepare for this event. They use props, costumes, and visual and sound effects. Mother tongue students in high school usually perform a play of literature and act for 2 hours. During the event, Japanese snacks and bento boxes are sold outside of the theater. Required materials: A stage, a screen to project subtitles and visual effects, a PA system for sound effects, Japanese snacks and bento boxes, costumes. Estimated budget: We spend money on new costumes and props, Japanese snacks, bento boxes and food for weekend practice. We ask student’s parents for donation to purchase the listed items every year and school to create a back account only for the Japanese department to save the leftover. Preparation: We spend class time for preparation and some weekends for long plays. It takes about a month. We ask parents to buy and sell Japanese snacks and bento boxes so that we can focus on instructions and rehearsals. We set up lighting and the timing of sound and visual effects with school media staff. Promotion: Email school staff, administrators, student’s parents, and Japanese teachers in the region. Post flyers in school. Ask my school to put in official school calendar. Ask media staff to take photos for school website and social media. Invite local Japanese newspaper companies. Sell Japanese snacks, ramune, and bento boxes to the audience. Results: Since this is not a regular class activity, it actually gives students who has various learning styles an opportunity to improve their Japanese skills and encourage motivation and confidence. Since we have had this for a long time, people in our community recognize this event and the effort of students, parents volunteers, and teachers. To present Japanese culture to the city of San Antonio. To provide opportunities for the Japanese language learners to show their talent and enthusiasm by having Karaoke and Cosplay competition, Yosakoi dance presentation. To share their knowledge about Japanese culture with the community by offering game/craft booths. Description: The fall festival was organized Japan America Society of San Antonio. Because I was the president of the society and also a senior lecturer at UTSA, I planned many activities that students can participate. I wanted to provide the place where the Japanese language learners have opportunity to mingle with the community to show and share their knowledge about the Japanese culture. A lot of students attended Karaoke contest and they sang Japanese songs. We also started Yosakoi dance group. Two of my students became leaders and encouraged students from other universities and high schools around San Antonio. Now this groups are asked to perform in many school related events, conference, and cultural events. We plan to expand this group to the community so anyone who is interested to learn Japanese language and culture is welcomed. Also Japan clubs from different universities participated as a game/craft booth. By doing so, they researched the typical festival games/crafts. For Karaoke contest, we rented a karaoke machine. For Yosakoi, Fabric for making the costume and Naruko (hand crappers). For Game/craft booths, they made water balloon and ring toss. For Yosakoi, they had to pay about $20 and it was challenging to recruit high school students because of the money. But we supported the high school students who wanted to participate. Preparation: The planning was about 3 months including the publicity and recruitment. Promotion: I advertized it to my students. Students helped us to make a flyer and spread the word. Also we posted information on the Facebook of Japan America Society of San Antonio. Results: We have to wait until the next year to see how many people will join the festival. But so far, Yosakoi dance groups are performing all the events and recruiting more dancers. 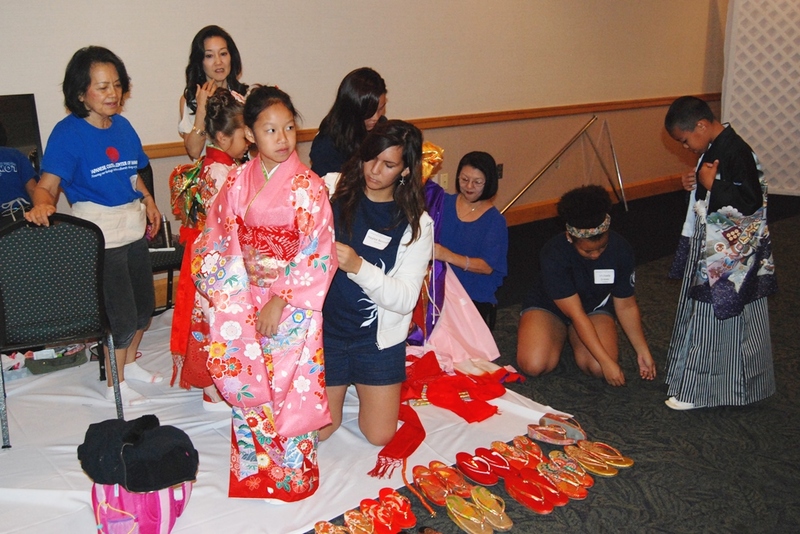 Objective: To share Japanese and Asian culture with students, families, and community members. Description: The four high schools in my district collaborate to hold an annual Cherry Blossom Festival in March. This coincides with each high school's sister school's visit from Osaka, Japan. At Cherry Blossom Festival, student volunteers, PTSAs, ASBs, and school clubs participate to sell Japanese food and drink, hold a Talent Show performance, provide activities and games for children, and share cultural learning through booths, displays, and demonstrations. Local martial arts groups, taiko groups, and Japanese cultural groups hold demonstrations or performances. Game booths are similar to any matsuri games and include goldfish, a kimono portrait booth, mask-making, kamishibai, origami, and yo-yos. Talent Show performances highlight various styles of music and dance. Each year the festival is hosted at a different high school. The host teacher carries the bulk of the responsibility for planning and coordinating the event. Estimated budget: We carry money over year-to-year. 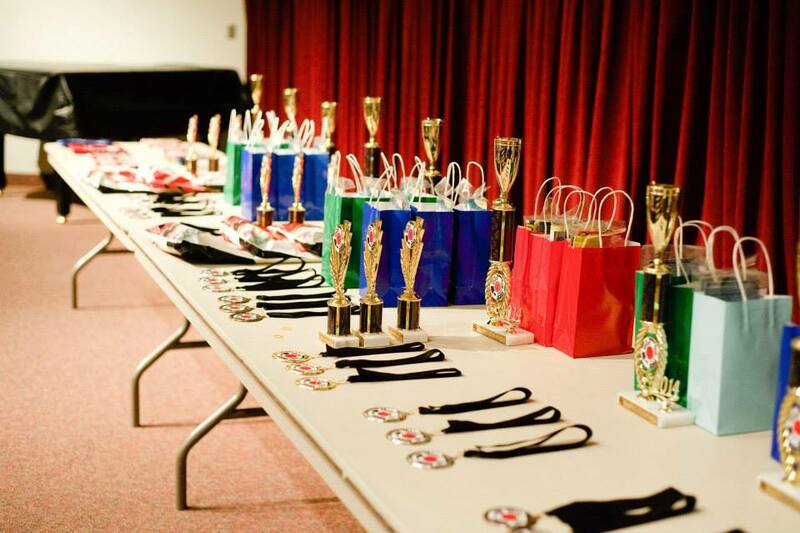 Costs include: ingredients for food; printing costs for promotional posters, school maps, and programs; materials and prizes for game/activity booths; rental fees for building use. Preparation: The high school Japanese language teachers, plus PTSA and ASB cashier representatives, meet monthly starting in October to plan the event. We invite local Japanese companies to sell items as vendor booths, including Kinokuniya and the local Japanese grocery store. We also invite representatives from the Japanese Consulate. We receive support from our building administration and staff, as well as from PTSA, in numbers of volunteers and manpower. Promotion: Promotional posters are posted in the community and in all district schools. The host teacher contacts the local newspapers prior to the event, and reporters are invited to attend. An announcement is made on the district website. Results: We have a post-event debrief meeting to discuss outcomes. The PTSA handles the bulk of the money and provides the numbers of entry tickets sold so we can compare numbers from year to year. Objective: The goal was to create a video to promote the Japanese program. I wanted something that students, parents and administrators could share easily online. I also wanted viewers to see real students speaking Japanese as well as hear from professionals how the ability to use Japanese had shaped their careers. 1) I asked students to create a short video, 1 minute or less, about why people should study Japanese. Students had to present their reasons in Japanese. 2) I contacted several professionals I knew who used Japanese in their jobs and asked them to speak on camera about their experiences. 4) We found that we had too much footage for one video alone and so we split the project into two. The first one addresses the question, "Why should I study Japanese?" The second video addresses the question, "Is Japanese relevant in today's job market?" Budget: It did not require any money -- just a lot of time to edit the footage! Preparation: I first suggested the idea to students to get their feedback and assess whether or not they were interested in helping. Then I e-mailed the adults I wanted to interview. My assistant (from the JLEAP program) helped a lot with video editing. From start to finish I think the project took about 3 or 4 weeks. Promotion: I asked my administrators to post the video on our school webpage. I posted the video to my Facebook accounts and asked students to share them as well. In addition, the videos are now on my program webpage where all my current students can see them. Results: I had several students who came new this Fall who said they had seen the video over the summer. One of my high schools also recently updated the video and we made sure that it is on the school webpage. Objective: To help current students and parents understand the benefits of learning Japanese. Description: The Japan Times includes articles from students, alumni, teachers, administrators, parents, and exchange students. The parents are able to learn more about the program and find out what graduates do with their Japanese education. We originally printed the Japan Times and sent them to each family with a son or daughter taking Japanese, but in an effort to be more green and to save money, we now send a copy of the Japan Times to families in PDF format. The feedback for this has been great and because we email it instead of printing it, the Japan Times can be completed free of cost. The main goal of the Japan Times is for families to understand the progression from K-12 and what graduates are able to do with their Japanese. 2) Articles from students, teachers, parents, graduates, administrators, and exchange students. Estimated budget: If you do not print it, it does not cost you anything to make it. It takes anywhere from 30 to 40 hours editing the articles, formatting the newsletter, making borders with the students' pictures, and Photoshopping each author's head onto a theme for the Japan Times. Promotion: I send the Japan Times to all parents (whether they are taking Japanese or not). This gives an opportunity for all parents to read how their education at school is helping their son or daughter after graduation. Because all parents receive it, everybody is able to read the Japan Times. Results: I know that the Japan Times is successful because of the feedback from parents and students. They tell me what they have learned after reading the articles. Objective: To raise awareness of the brand new Japanese program in Marysville, Ohio, to teach people the benefits of learning the Japanese language in Ohio, and to share all of our year-long accomplishments with our community, parents, teachers, students, administrators, and board members. Description: The annual NIHONGO newsletter is comprised of various includes articles which we collected from students, visiting university professors, guest visitors who have a Japanese-related career, Japanese Society leaders, teachers of Japanese, and administrators. Besides the written articles, we included Japanese related events such as opportunities for hosting Japanese students, foreign language summer camps,upcoming trips to Japan and our new exchange program, student awards and rankings for the National Japanese Exam, awards for the Nengajo Contest, participation in JASCO speech contest, information on joining the National Japanese Honors Society, and summer tutoring. The parents, community, and school district could learn more about what our year was like in Japanese, as well as why taking Japanese is relevant for our students. We printed enough copies to send home with every student taking Japanese and sent PDF versions by email to all of the district, parents, BOE, teachers, and city. 2) Articles from students, teachers, volunteers, visitors, administrators, and professors. Budget: We used the school's printer to color print enough copies to hand out to about 150 students in our Japanese 1 classes to take home to their families. We sent everyone else email PDF versions. It did not cost us anything to make the actual newsletter because my husband volunteered his time to compile it and edit it via InDesign. Preparation: I originally attended the CATJ Conference in spring 2015, and was inspired by William Matsuzaki's Japan Times newsletter. He presented on the importance of program advocacy.I asked older students interested in Japanese and continuing Japanese in college to write articles. I also asked independent study students, and freshmen and upperclassmen. This allowed for a variety of experiences to be showcased. I asked them to write about their honest expectations, fears, and achievements. I also asked visitors, professors, our principal and the director of JASCO to write articles about their interaction with our Japanese program. The other Japanese teacher and I both wrote articles about our year-end reflections and what we were excited for next year. I asked students for articles in April and gave them about 3 weeks to submit them to me. It takes about 40 hours to compile, create a theme/template, and edit the newsletter via InDesign. Once a template is made it's reusable for future years. Promotion: I made two versions of the newsletter. We sent the print copy home with all students in Japanese classes. We emailed the PDF version to all parents of all ages in the entire district.This raises awareness and students can look forward to enrolling in 7th grade exploratory and continuing through high school. We also sent out the email to BOE. Results: The feedback via email from colleagues, district, board of education and city officials is very encouraging and positive. The parents are very excited to see their children's accomplishments. I give students an extra credit opportunity to bring back a note from a parent stating that they have read the newsletter. The adults want to learn Japanese!